Celebrating female athletic success is critical, but it is equally important to examine other factors that influence sport participation. Many sport sociologists have pointed out that Title IX has benefitted white women more than it has benefitted women from other racial or ethnic groups. They have also found that young people who aspire to be athletes have an easier time imagining themselves as successful in a sport if media images of that sport contain people that resemble them. The SheBelieves tournament is a good time to think about who the public will see when they watch some of America’s most beloved female athletes. To assess this, I reviewed the past and present rosters of the team and recorded information about each player’s racial appearance. A research assistant helped me categorize the players and investigate their biographies for more information about each player’s background. Of course, photographic assessments don’t always align with player self-identification, but they do reflect the racial labeling system that is embedded in U.S. culture and, thus, suggest how the players are likely to be viewed by the audience. Within this system, those with fair skin are often classified as white, while individuals with darker skin tones are classified as non-white. With respect to skin color, the history of the “one-drop” rule suggests that individuals who have some black or African ancestry are non-white, even if those people also have white or European ancestry. For the 2017 SheBelieves Cup, 76% of the U.S. players are white, while 24% are not. This roster features more players of color than recent American teams, but slightly fewer players than the US teams of the mid-2000s. 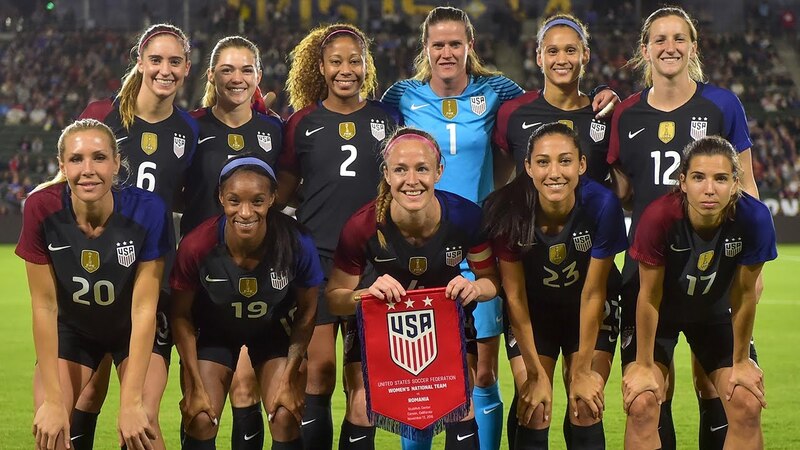 Between 1999 and 2016, the U.S. women appeared in five World Cups and five Olympic tournaments. According to published records, 68 different women were rostered for the U.S. in those 10 events. Of those women, 58 were white (79%), while 14 were women of color (21%) (you can find full data at the bottom of the page). According to the 2000 and 2010 census, whites made up 75.1% and 72.4% of the population, respectively. This means that among the U.S. women’s team, white players are slightly overrepresented in comparison to the general population. A deeper look shows that the players don’t necessarily reflect the racial and ethnic diversity of the United States. There are six players of color on the current roster. Four of them (Casey Short, Christen Press, Mal Pugh, Lynn Williams) are multiracial and two of them (Brianna Pinto and Crystal Dunn) are black. The increase in women of color from the last tournament is a welcome change; however, nationally, these two groups (black and multiracial) represented 15.5% of the U.S. population. Latinos of all races, who make up 16.3% of the population, are barely represented among the players. Amy Rodriguez, the only current Latina, has Cuban grandparents but is phenotypically white. According to my research, there has only been one other Latina national team member, Stephanie (Lopez) Cox. Several former players (Tiffany Roberts, Lorrie Fair, and Natasha Kai) were Asian/Pacific Islander, but none of the current players are, even though these groups represent five percent of the U.S. population. Furthermore, all of the current players were born in the United States. These numbers seem especially low given the massive popularity of soccer across Latin America and Asia as well as the cultural importance of soccer to American immigrants from these regions. It’s also interesting to note that the women’s team stands in sharp contrast with the U.S. men’s national team. The latest roster of the men’s team (Feb. 3, 2017) is almost equally split between white and non-white players. Of the 21 players, one third have Latino ancestry; two of those players also have Asian ancestry. Further, several of the men’s team members immigrated to the U.S. as children or were born to immigrant parents. Bottom line, the men’s team reflects the global popularity of the game, while the women’s team does not. What does existing research tell us about this difference? Not much. The majority of research about race in American sports examines blacks and whites. Though there are some notable exceptions, the research on Latinos and Asians in sport has generally not included women, so we know very little about their participation in soccer or other sports. Globally, female athletes from Latin America and Asia have struggled for acceptance, recognition, and resources, which limits youth participation and influences cultural perceptions. Immigration scholars have noted that Latino and Asian migrants tend to place stricter regulations on girls than they do on boys. Both cultures also tend to place a great deal of emphasis on academic achievement, especially for girls. There is also some evidence that the structure and location of the national team pipeline might be a barrier for some women of color. Though these explanations are all helpful, it is important to remember that there is tremendous diversity among the U.S. Latino and Asian populations in terms of social class, immigration status, and length of residence. Though we may not know much about why Asian and Latina women are not playing soccer at the highest level in the U.S., I hope that this story functions as a call for us to learn more about these communities and their involvement with sport. It is possible that these groups are playing other sports or are participating at more local levels. For example, NCAA data shows that Asians are represented well in tennis and golf but not in other sports. We should investigate the ways that race, ethnicity, immigration status, language, social class, and (dis)ability all interact to influence sport participation among these groups. In addition, we need continued research on how these factors also matter for black and multiracial women who are playing sports other than track and basketball. Research consistently shows that sport involvement helps young women develop self-confidence and learn lifelong health habits, and thus it is vital that sport experiences are not limited by race or ethnicity. As the American population continues to grow and diversify, and as women continue to embrace athletics, the sport community must engage with more diverse populations to ensure that there are meaningful opportunities for all women to play and to believe. Jen McGovern, PhD, is an assistant professor of sociology at Monmouth University. Her research centers around how race, ethnicity, and gender interact to influence experience and opportunities within sport, exercise, and physical fitness.